In today’s virtual age, we believe this immersive video technology can connect travellers on a deeper empathetic level with the world around them. When it comes to tourism, imagine what could become accessible online. One of the first corporations to use virtual reality to promote tourism was Destination BC, showcasing the Great Bear Rainforest with their video The Wild Within. It allowed viewers to hike, boat and ride through several of the province’s national parks. In 2014, the Marriott debuted two teleporters, transporting it’s hotel-goers from cold New York City to the warm beaches in Maui. It also featured “4-D elements”: pneumatic pumps embedded in the floor, misting nozzles in the walls, and heater blowers in the ceiling. All to deepen the immersive experience. For example, when you land on the beach, the pumps in the floor create the feeling of a cushioned landing, and you feel 80-degree warmth, a sea breeze, and ocean mist. Virtual reality gives travel and media partners a chance to experience your destination in a new and unique way that has not been possible before. Where is Virtual Reality headed? It’s not just for gamers! It’s predicted that by 2018, 170million virtual reality headsets will be in the hands of consumers. Beyond gaming, VR will be an important platform for streaming content and even shopping, making it easier to shop online. The Samsung Gear VR headset sold out on Best Buy and Amazon in a manner of days, during the 2015 Black Friday rush. Shipments of VR headsets are said to grow at a swift 99% compound annual growth rate between 2015 and 2020. By 2020, virtual reality is predicted to be a $30billion industry and will be a mainstream way to view content. We offer a full service experience, where we will work with your team from concept to distribution, to produce the best VR product to tell your story. We were one of the first companies that produce both 360˚ photography and videos. An immersive photo created by capturing a series of images as the object rotates over a 360 rotation (camera stays in a fixed position). Taking 360˚ photography to the next level by capturing a series of images from a few hours to a few days (camera stays in a fixed position). This is perfect for highlighting a national monument or a spectacular view of the city; much like our Deep Fog video. Through sensory stimuli (as sights and sounds) travellers will experience a fully immersive 360˚ video environment. An example of this is the experimental short film Memory Lane (seen above), using robot controlled 360˚ moving time lapse. As part of the full service package, we can put your logo on a cardboard headset! 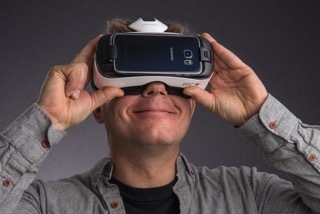 Cardboard headsets can be used with iOS and Android smartphones. We can make your 360˚ videos playable on your Youtube channel and Facebook page. We have special relationships with Oculus and Littlstar, and are able to request your channel be featured on these virtual reality sites.